A professional traffic analysis requires measuring data of high accuracy. Often, significant traffic data can only be acquired over a longer period of time. Traffic measurements on single days or over the period of a few hours are always put at risk of being inaccurate because of short-term events (e. g. accidents, traffic jams) and therefor lose significance for further traffic prognosis. With the aid of the V-REX number plate recognition system, especially large investigation areas can be analyzed in regard to origin and destination traffic as well as transit traffic. Due to an automatic capture of licence plate numbers with special infrared cameras and the use of robust OCR algorithms a high accuracy of the collected data can be guaranteed (contrary to conventional 'manual traffic census'). 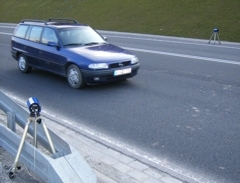 V-REX is a state-of-the-art ANPR system which can be used very flexible due to its compact design. 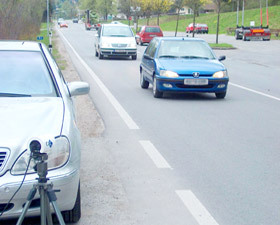 One camera can easily monitor two lanes whereas no additional trigger (e. g. laser, radar) is required. Traffic volumes at single traffic junctions or the traffic flow along several traffic junctions can also be determined using V-REX number plate recognition.